← Hitting the Wall – Is Quartzsite Pushing it? It was our intention to leave on Wednesday, so we delayed the trip another day. However, we are packed and ready to go! We underestimated the time it would take to do all the things we wanted to do in order to leave our home for 3 months. So we made the call to leave early Thursday morning. That delays the original plan by 2 days and we’ll need to drive extra in order to get to Quartzsite by next Tuesday. We’ll need a day to stock up and prepare to boondock in the desert for a few days once we get to Arizona. We need to un- winterize our rig at a campground also if we haven’t done it before then. The last task we did on Wednesday was fill up with gas and propane and drive Minnie Pearl over to the local truck stop to get weighed. She gained 1,020 lbs! It seems like a lot, but filling up with 55 gals of gas adds considerable weight. Gasoline weighs 6.183 lbs per gallon so that makes up 340 lbs of the total weight. We were meticulous and weighed everything we packed from clothing, food, gear, electronics, maps and paper work, and other miscellaneous items. We’ll provide those statistics in another post. We have always been heavy packers, however we are trying to streamline and simply the way we travel. It is a continuous work in progress. We were off this morning at 5:30 am sharp. The first days destination was supposed to be Plainfield, IN, however the weather forecast for the area didn’t look too promising. Winter storm Jupiter was wreaking havoc with our travel route. We had been planning to go across the plains right where the storm path was predicted. The storm was moving into the area and the night temperature low was forcast as only 24 degrees! So we changed our plans the last minute and decided to head towards Nashville, TN to avoid the storm. The temperatures in TN are much warmer and the night lows are 46 degrees…much more comfortable. Thank goodness for the weather apps! They certainly make travel much easier and safer too. The weather apps will be a main guide and resource that we will use on a daily basis. We have stopped for the night and made it to Cave City, Kentucky. We drove 529 miles in 11.5 hours. That’s an average speed of 46 MPH. The entire trip was in rain and winds of 15 mph with gusts up to 26. There were a few times we thought we might get a break, but not for long. There was some congestion and delays around the Columbus, Cincinnati and Louisville. We’ll be getting on I-40 tomorrow and that will take us all the way to Arizona. The evening air feels nice and it’s pretty quiet. It won’t be long before we turn in. Good night! 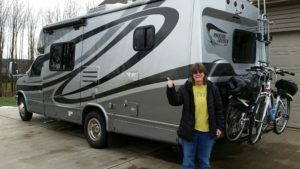 This entry was posted in Arizona, Uncategorized and tagged Quartzsite, RV weight, Winter Travel. Bookmark the permalink. Looking forward to hearing this story on out next camping trip with you and Lida. Thanks Barb. We know you enjoy the open road as well! Like the icons in your comment. And we’re so glad to have you along!